Hooliganism struck the Australian Open (AO) again yesterday during the match between last year's finalist, Fernando Gonzalez and Greece's, Konstantinos Economidis. 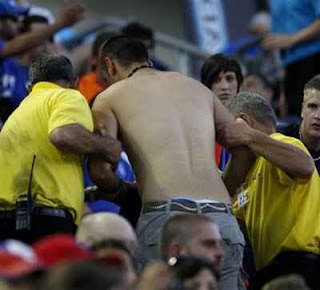 Police had to use pepper spray to subdue three spectators and ejected five fans off the grounds at the AO. Last year, Croatian and Serbian fans clashed at the same tournament , by using sticks and flag poles, which resulted 150 spectators being ejected off the tournament during it's first day of the 2007 AO. The organizer should beef up on their security and ensure no such hooliganism acts in the future. Fans should understand that there is no place for violence in tennis. 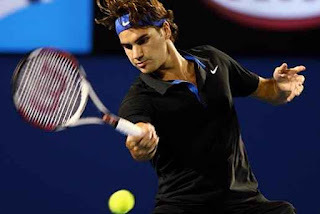 Moving on to some lighter note, it seems that nothing goes wrong with Roger Federer all these while until he wears the new Nike Black Collection since last US Open. 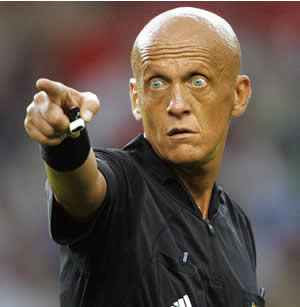 He looks nothing but like a football referee. Maybe I am wrong. Federer looks like a winner too. So, I'll spare him the yellow card.